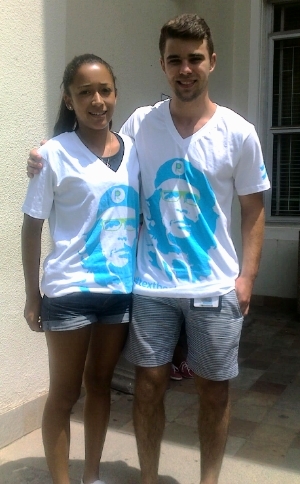 Two #textbookrevolution supporters get their hands on great T-shirts! Paperight has officially launched the #textbookrevolution and supporters are flying in thick and fast. We now have #textbookrevolution partner copy shops across 10 universities in South Africa – and this is only the beginning. Publishers, students and lecturers have also been coming on board, joining an initiative that intends to blow apart the existing monopolies that drive textbook prices sky high. This week the Paperight team took the long drive out to Stellenbosch to chat to students face-to-face and hear their concerns. Sporting #textbookrevolution t-shirts, we hooked them with a batch of limited edition Paperight drinks coasters emblazoned with the tagline “Cheaper Textbooks. More Beer”. Then we got down to business. We asked them to sign a petition calling for publishers to give them a cheap and legal alternative to buy their set works. Students, many of whom were on bursaries, were enthusiastic with the prospect of saving cash for other important expenses. One student we spoke to said that she had a textbook that cost her R1300 and another lamented the fact that she had to buy 8 books for her final year of Law; none of them cost less than R900. As we walked around town we had students coming up to us as their friends had told them what we’re up to and we heard snatches of enthusiastic conversations about “those textbook revolution guys”. The #textbookrevolution hashtag has propagated across Facebook and Twitter with energetic commentary. It seems a no-brainer that students would love the idea and now we are well on our way to gathering the testimonies, signatures and demand that will help us initiate a significant change on their behalf. Publish the #textbookrevolution manifesto in your varsity newspaper or speak about the it on your varsity radio. Ask your lecturers why your textbooks aren’t available on Paperight – they can influence the publishers. Sign the #textbookrevolution petition on the campaign website. Send us your logo to be added to our supporters’ bar on the campaign website. If you want a cool #textbookrevolution poster to stick up at your school, residence, outlet or anywhere, get in touch with us at team@paperight.com.